Digital Dining’s Restaurant Email Marketing program allows restaurants to promote their business and reach more customers more often with less effort and less cost. Increase repeat business and attract new customers by tracking your customers in Digital Dining’s Customer Relationship Management (CRM) system, and then send targeted email marketing campaigns and other restaurant advertising efforts using Digital Dining’s Restaurant Email Marketing system. Most successful restaurants are already employing customer tracking, loyalty programs, and using their websites to harvest customer mailing lists. 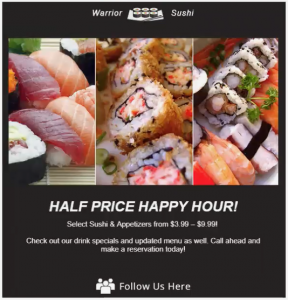 Digital Dining’s email marketing system provides restaurants with a place to collect all of those customer emails in one place, and then market directly to them with targeted customized email marketing campaigns and strategic single use coupons. Our Email Marketing system uses email rather than costly print or mailed marketing, so your restaurant is able to market to more customers more often with less cost, providing more information and promotions to your valuable customers. As a result, your restaurant’s relationship with those customers significantly improves. 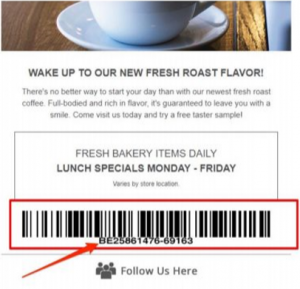 With Digital Dining’s email marketing system, campaigns can include bar-coded single use coupons. 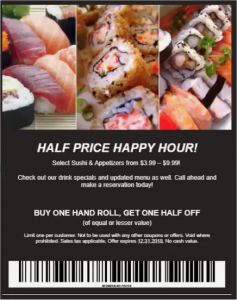 Redemption of those coupons are scanned and tracked at the point of sale by Digital Dining, significantly reducing coupon fraud. Because email marketing campaigns are targeted to specific customers and redemption is controlled at the POS, you can track redemption frequency and customer spend as a result. Restaurant owners can gain valuable insight into customer spending patterns, customer dining frequency, and this enables owners to creatively find ways to increase customer spending. Digital Dining’s Email Marketing is all managed in the cloud, it’s perfect for single locations, or multi-unit restaurants alike. Restaurant managers will find the Email Marketing system easy to use and easy to access, so training time is negligible. With Digital Dining’s Email Marketing System, restaurateurs can market smarter to more customers, more often, with less hassle, less fraud, and less cost!